According to German media, Israeli intelligence provided information on bomb attacks planned for soccer stadium in Hanover. Israel helped thwart a major terror attack in the German city of Hanover last week, German media reported on Wednesday. According to Stern magazine, Israel offered crucial intelligence on an anticipated terror attack targeting the soccer match between Germany and Holland's national teams. Israeli intelligence provided German authorities with information about a planned bombing at the HDI Arena as early as last Monday. More concrete information, including specific details of the attack, was passed over the next day, Tuesday, November 17. As a result of the information, the game was cancelled and the stadium evacuated, only 90 minutes before the match was set to begin. Shortly after the German national soccer stadium in Hanover was cleared of people, an ambulance loaded with explosives was discovered parked outside. 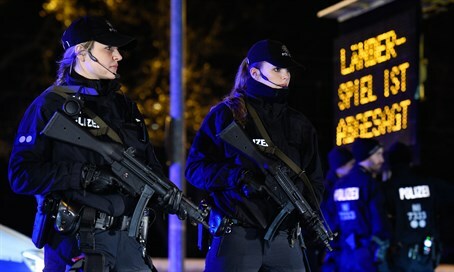 Another site in Hanover - the 14,000 seat TUI Arena, in which a concert by the band The Söhne Mannheims was to be held - was also evacuated last Tuesday after police received a "concrete threat" about a bomb. The attacks were reportedly meant to be modeled after the Islamic State (ISIS) attacks in Paris the previous Saturday, in which 130 people were killed. Paris' Stade de France stadium as well as the Bataclan music hall were targeted in the ISIS attacks on November 13.